SUPER TIME FORCE ON XBOX ONE! We’re happy to announce that our insane time-traveling run’n gun platformer Super Time Force is coming to Xbox One. Bringing Super Time Force to Xbox One means that all of our fans that have made the jump to the new generation of consoles can play our game on the fancy new machines they just plugged in, and it also means you can play with the sweet new Xbox One d-pad. 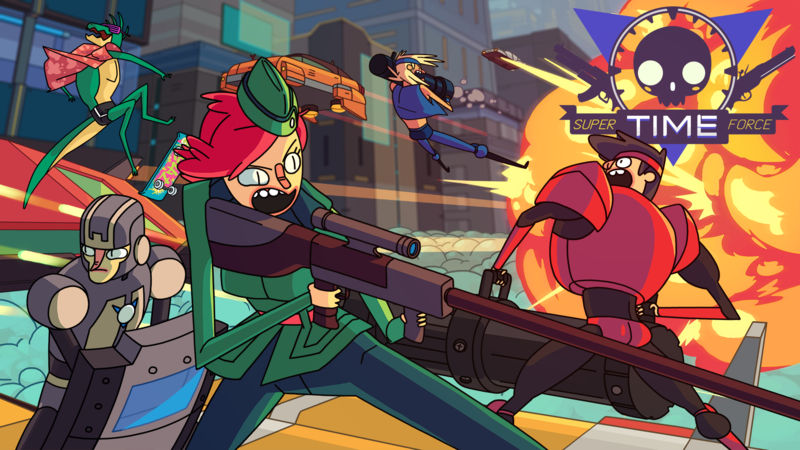 In extra-awesome news, we’ll be self-publishing Super Time Force on Xbox One via the ID@Xbox program. Of course, Super Time Force is still coming to XBLA as planned. We’re aiming to launch both versions side-by-side, Game Gods willing. To accommodate development of the Xbox One version, and to make sure we bring you the best game possible, we’re moving the release date. While we had originally intended to release this year, the opportunity to do Super Time Force on Xbox One, plus the sheer insanity of releasing during new console launches meant that moving a few months into 2014 was the best plan for our game. At Capy, we tend to work on multiple projects at once – in this case, Super Time Force & Below. With these projects, we’re constantly exploring new ideas, and doing so generally means we need to keep our games in the oven for as long as humanly possible. It’s the nature of the beast, but it’s also core to the personality of our studio. We take our time and we aim for the stars, but that often results in the intervals between our games being longer than we (or our beloved fans) may anticipate. We appreciate the love & support, and see you in 2014!